Army Pfc. Darian Hampton of Task Force Toccoa sneaks past a Cameroonian defender for a layup April 21 during a basketball game with American and Cameroonian service members in Garoua, Cameroon. The task force, which is supporting Cameroon's efforts against Boko Haram, decided to hold the game to help build better cohesion between American and Cameroonian military members. GAROUA, Cameroon — American and Cameroonian soldiers come from entirely separate parts of the world with distinct cultural differences. But on April 21 they discovered something in common — the urge to beat their respective countries’ air forces when given the chance. 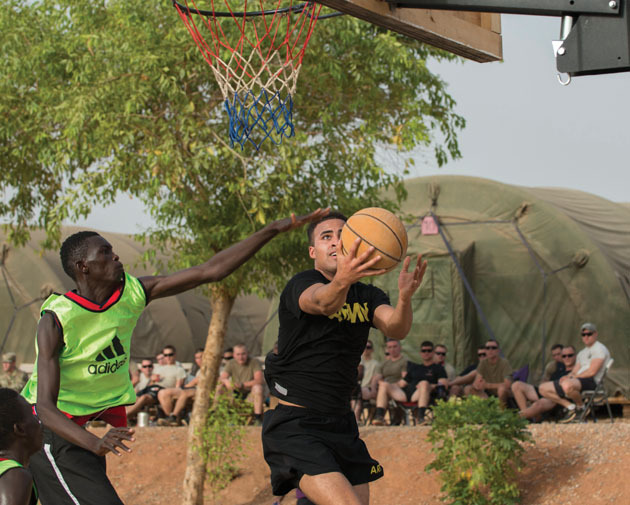 A few days before the game, members of Task Force Toccoa, a 101st Airborne Division-led unit based in northern Cameroon, built a basketball court with freshly painted lines and hoops weighed down by concrete blocks next to an active runway. They then invited Cameroon service members from the local area for a basketball game to help foster better cohesion. 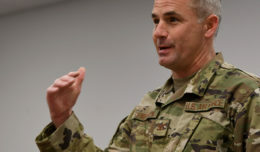 “This is a chance for us to work side-by-side in something that is lighthearted,” said Army Maj. Max Ferguson, who heads the task force that supports Cameroon’s fight against Boko Haram, a violent extremist group in the country’s far north region. 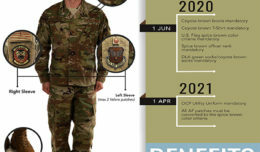 Wearing his black exercise uniform with “Army” in bright yellow letters, Pfc. Darian Hampton, who does security missions for the task force, joined a group of Cameroonian soldiers from the local gendarmerie unit, the country’s paramilitary force. While many of the host nation players spoke French, Hampton said there was still a universal language out on the court. Hampton, who played basketball for Robert Morris University in Pittsburgh, helped lead his team to a 62-43 victory over a team consisting of U.S. and Cameroonian airmen. No matter the country they were from, players said, the friendly rivalry between the army and air force was alive and well. 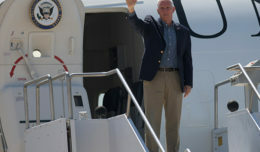 One of Ngepi’s troops, Alexis, had the game’s only slam dunk, which fired up the crowd of about 50 Americans and Cameroonians at the task force’s contingency location, situated on the Garoua air base. Alexis, whose favorite NBA player is Russell Westbrook of the Oklahoma City Thunder, said he has always admired the game, which is not as popular as soccer in his country. After the game’s initial success, there’s talk of extending the bilateral competition to soccer. Hampton said he’d be on board for it. If that happens, the U.S. troops will have to be more prepared since many of the Cameroonian players performed better than expected during the basketball game. As for the basketball game’s final score, Ferguson said that wasn’t the point of having it.